Points Needed: 9800 Games are not compatible with mobile and tablet devices. Please add this title to your Wish List and sign on to your the first club account from a desktop computer to complete your redemption. EARLY ACCESS GAMEGet instant access and start playing; get involved with this game as it develops.NOTICE: Activation key must be used on a valid Steam account. Requires internet connection.ABOUT THE GAMECaptain your own space ship and roam the galaxy in 3D in this tactical space simulator with tons of RPG depth ! Space has never looked so inviting - but images can betray...It has been two years si… nce the end of the second Gemini war, and the situation in the wartorn system is further from resolution than ever before. The collection of freedom fighters named Gemini League is now reduced to a small group, with no power or influence, after losing their leaders. The Empire meanwhile, has used the re-opened Starpoint to occupy the once renegade Gemini sector - and beyond. A multitude of Imperial warship fleets and mammoth motherships have crushed every trace of opposition. The situation was looking bleak, when they suddenly halted their armada and re-shifted their focus on fortifying Starpoint with staggering numbers. Rumours soon spread that they were afraid of something coming after them through the T-gate, from what was supposed to be the core of the Empire. 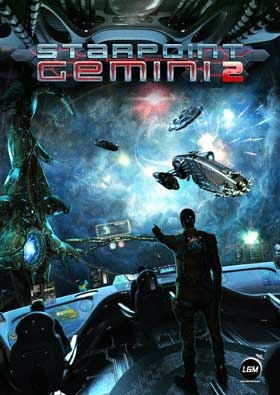 What are they running from that makes even the mighty Empire tremble?Starpoint Gemini 2 will take players on a breath taking journey, with dark secrets and unimaginable twists that will finally unveil the incredible truth...KEY FEATURES Complex, but easy-to-use RPG system, now coupled with dynamic real-time 3D combat. Explore the dynamic game world as a whole, rather than through individual maps. Use T-Gates, wormholes and riftways to travel faster around the Gemini system . Fifty diverse factions ranging from states and companies to outlaws, locked in a powerstruggle, with over 100 commodities to trade or plunder. Special revocable licenses acquired from factions offer various bonuses and unlock new options. Hire mercenary captains to follow you on your travels and share your fate, and employ officers to fill key positions on your ship (engineering, navigation, tactical). Random missions get generated depending on the player’s actions and allegiances. Over 70 unique ships, fully upgradeable with various ship systems, with a.o. visible turrets, and a large arsenal of destructive weapons to blast enemies to pieces. Direct ship controls create complete immersion. Advanced physics provided by NVIDIA PhysX technology.SYSTEM REQUIREMENTS Minimum: OS: Microsoft Windows 7, 8 Processor: 2.2 GHz Dual core or equivalent Memory: 2 GB RAM Graphics: DirectX 10 compliant graphics card with 512MB RAM DirectX: Version 10 Hard Drive: 8 GB available space Sound Card: DirectX compatible sound cardRecommended: OS: Microsoft Windows 7, 8 Processor: 3.0 GHz Dual core or equivalent Memory: 4 GB RAM Graphics: DirectX 11 compliant graphics card with 1GB RAM DirectX: Version 11 Hard Drive: 8 GB available space Sound Card: DirectX compatible sound card Starpoint Gemini 2 © 2013 Little Green Men Games. Developed by Little Green Men Games. Licensed exclusively worldwide to and published by Iceberg Interactive B.V. All brands, product names, and logos are trademarks or registered trademarks of their respective owners. All rights reserved. Made in Europe.